SERBIE – Pirot / Suburbium - Over the past two years, archaeologists discovered an ancient suburb of Pirot, called Suburbium, the remains of the legendary 2,000-year-old road, Via Militaris, located near Dimitrovgrad, and several ancient milestones. 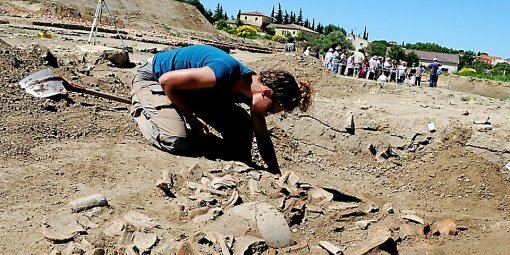 Mirjana Blagojević, an archaeologist consultant of the Institute for the Protection of Cultural Monuments of the Republic of Serbia, who heads the archaeological field surveys on the Corridor 10 section near the village of Sinjac, has said a unique necropolis complex over 2,500 years old was discovered. “We have found three skeletons of warriors with spears, knives, iron fibulae, bronze ornaments, rivets and leg decorations, Blagojevic said. Predrag Pejić, an archaeologist at the Ponisavlje Museum in Pirot, has told Tanjug that this is a very important archaeological discovery. 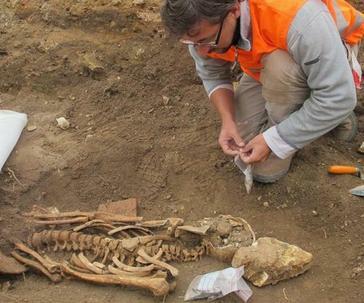 "We had found a lot of graves older than this one in Pirot, but the remains were buried in them after being cremated on a funeral pyre, whereas here we have for the first time a community who conducted full body burials," a unique find in this part of Serbia. FRANCE – Magalas - Dans dix-huit mois, 37 maisons s’érigeront à la sortie de Magalas, sur la route de Fouzilhon. Mais depuis avril, dix archéologues mettent au jour une construction un poil plus ancienne... Un temple romain datant du Ier siècle de notre ère, flanqué de ses habitations pour pèlerins et familles. Un site antique rarissime au pied de la colline de Montfau, connue pour abriter un oppidum. Un autre sanctuaire avait été découvert à Roujan il y a vingt ans. "Ici, il ne s’agit ni d’une simple villa romaine, ni d’une ferme, mais d’une véritable agglomération, une petite ville où l’on venait prier et loger sur place", détaille Olivier Ginouvez, responsable des fouilles. Rien moins que les fondations d’un temple public de 9,50 m sur 5,50 m, avec son porche et son cella, la salle du culte destinée à accueillir la statue de la divinité. Derrière, une esplanade de 2 500 me avec des traces de bâtiments. À Magalas, la configuration des bâtiments est l’intérêt principal du site. Seuls des fragments d’objets de culte ou de la vie quotidienne ont été révélés, ainsi qu’un four datant du IVe siècle. Reste un puits qui fera l’objet de fouilles car il était d’usage d’y jeter les objets après l’abandon d’un sanctuaire. FRANCE – Châteauroux - Les fouilles de la place Saint-Christophe viennent de débuter. Les archéologues de l’Inrap ont déjà fait de très intéressantes découvertes. Fin du chantier lundi. comme prévu, les chercheurs venus de Tours n'ont pas eu à creuser très profondément pour faire d'étonnantes découvertes. « Le problème n'était pas de trouver des vestiges de l'ancienne église démolie au XIXe siècle et du cimetière. Des archives indiquaient qu'ils existaient, souligne l'archéologue, Raphaël De Filippo. Le but de cette phase de diagnostic était surtout de savoir dans quel état se trouvaient les vestiges mis au jour. » En attendant, ils creusent. Et ils ont déjà trouvé deux squelettes à proximité de la fontaine, dont la datation reste à déterminer. Moyen Age, XVIe ou XVIIIe siècles ? L'époque d'inhumation est encore incertaine. Pas de doute, en revanche, concernant le mur mis au jour sur le parking proche de la boulangerie : « Il s'agit bien de l'angle du chevet de l'ancienne église », indique Raphaël de Filippo. USA – Coopersville - When he first purchased property along the Great Chazy River in Coopersville in the 1990s, Andy Black never imagined he would unravel a mystery that had been buried for two centuries. “This site looks like an old homestead that was on the property no later than the 1820s,” Black told about three dozen people in attendance. “It’s very well preserved and can tell us something about the people who settled there.” As a professional archaeologist, Black initiated that requirement and came across artifacts that suggested the property had been used by settlers of the Champlain hamlet of Coopersville early on. In an area adjacent to the river, he found several artifacts, including bricks, china fragments, glass and the bones of fish and pork — the remains of food those original settlers had been eating. In 1999, he enlisted the aid of some students from Potsdam University, who helped set up an excavation grid and began searching for further evidence of the homestead. At one point, they found a fairly well-preserved wooden beam that happened to be hollow inside. Upon further investigation, the beam turned out to be part of a drainage system from the former homestead to the river. However, official records of property owners in the late 1700s and early 1800s are sketchy, and Black could not locate documents to specifically say who may have first lived on his land.A property map from 1848 clearly identifies other parcels in the area, but the people who had settled on the lot where Black’s efforts were focused were no longer there when the document was created. Working as an archaeology instructor for SUNY Plattsburgh, Black reopened the site as a living classroom for his students. Their work over the past few summers has allowed him to pinpoint where the original cabin stood, including the location of the settlers’ fireplace and an unusual crawlspace beneath the home. They’ve found a plethora of artifacts, including buttons, brass thimbles and even charred seeds that identify what kinds of fruits and vegetables the settlers had been eating. Pieces of dishes they collected helped pinpoint the homestead as pre-1820 by the color and design used on the china, he noted. “Dishes can tell us a lot about people,” he said. “Are they expensive or cheap, imported or local? Ceramics are very datable.” He categorized the china as inexpensive and probably manufactured locally. “This archaeological work has brought to light new information on how this family adapted to the environment, how they stayed connected to the wider, growing community and gives us a rare glimpse of daily life in a frontier area,” he said. There is still plenty more to uncover, he added. Work to this point has located the original cabin, but an aerial view of the surrounding pasture shows an oddly colored rectangle nearby. That location will be the focus of upcoming excavations, Black said. All combined, the work at Coop’s Pork N’ Fish Site offers a unique look at what it was like living in northeastern New York when settlements were just beginning to take shape. USA – Meadowcroft Rockshelter - Meadowcroft Rockshelter and Historic Village is considered one of the finest excavation sites in North America. This excavated site northwest of the Appalachian Basin in the Allegheny Plateau has signs of inhabitants 16,000 years ago. The rockshelter is a natural formation below an overhanging cliff of Morgantown-Connellsville sandstone. The rockshelter overlooks Cross Creek, a tributary of the Ohio River. Thick brown sandstone from The Pennsylvania Age provided shelter for Eastern Woodland Indians 400 years ago. Artifacts at the site indicate it was inhabited continually over 19,000 years, since the Paleo-Indians. Remains from the Woodland, Archaic, and Paleo-Indian have been found at the site. Albert Miller discovered the first artifacts 1955 in a ground hog burrow. Remnants of early inhabitants were found as deep as 11.5 feet underground. The dates are controversial, but Radiocarbon dating estimated the site was inhabited 16,000 to 19,000 years ago. If true this is the oldest known site of human habitation in the Americas. ROYAUME UNI – Silian - The find spot is just south-west of St Sulien’s Church, Silian (NPRN 402554), home to two further medieval inscribed stones. The church site, thought to have been of high-status, has been in use for at least 1500 years. Although the current church building dates from 1873, it is thought to stand on medieval foundations and has an early-fifth/sixth-century inscribed stone built into its south wall. The lost stone was first noted by Nash-Williams in The Early Christian Monuments of Wales; a cast of its inscribed face was made for the National Museum of Wales. It was tentatively ascribed to Silian because of the label on a photograph, also at the National Museum of Wales. The stone is referred to as ‘Silian 3’ in Nancy Edwards’ Corpus of Early Medieval Inscribed Stones and Stone Sculpture in Wales, Volume II, and its decoration is thought to be ninth/tenth century in date. 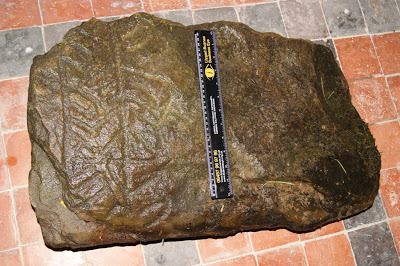 The stone measures 70cm x 38cm and decoration is visible on around a third of its face. The pattern includes a linear Latin cross with a lozenge shaped ring at its upper end. There are only two other definite examples of crosses in lozenge shaped rings in Wales: ‘Llanllawer 3’ from St David’s Church, Llanllawer (NPRN 308778), and ‘Llandecwyn 1’, from St Tecwyn’s Church, Llandecwyn (NPRN 43903). How the Silian 3 stone ended up in the steam is a mystery, especially as someone obviously once knew of its significance and took a cast.